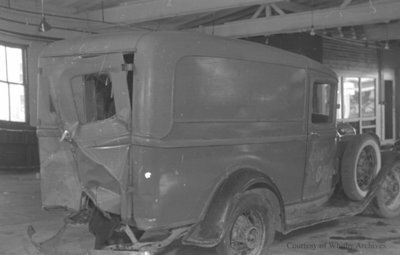 A black and white negative of a Ford delivery truck that has been in an accident. View is of the back of the truck. The truck is inside the garage at Whitby Motors Ltd.
Whitby Motors Ltd. was located at 103 Dundas Street East. It was built by William Davidson about 1917 on the south side of Dundas Street east of the Dominion Bank at Brock Street. Later the garage became known as Whitby Motors Ltd. Mr. Davidson operated the garage until his retirement in 1962. Truck Wreck, June 10, 1937, Marjorie Ruddy. Whitby Archives A2013_040_202A.